QuoteValet Mobile is a mobile quoting solution for tablets and laptops. Right from your mobile device, you can create a quote for a customer onsite and email it to them while you are still at their location. Once submitted, your customer can accept the quote and even make payment right on your tablet. QuoteValet Mobile is included with your QuoteValet subscription at no additional charge. QuoteValet Mobile requires little to no setup. QuoteValet Mobile is an extension of QuoteWerks. You use your QuoteWerks login credentials for QuoteValet Mobile and simply check a box in QuoteWerks to make a template available on QuoteValet Mobile. We have streamlined the mobile quoting experience by making it template driven. QuoteValet Mobile is particularly useful for quick, small orders. Once created, the QuoteValet engine takes over, allowing your customer to choose options that you provide, electronically sign, and pay by credit card. As changes are made to a quote created on QuoteValet Mobile, the PDF counterpart is automatically regenerated with the updated selections. The Documents Tab on QuoteValet Mobile provides you with an instant overview of your mobile quotes. You are provided with visual queues for quotes that have been accepted as well as quotes that have been paid for by the client. Also from this view, with a click of a button, you can hand your tablet to your client to sign and pay while you are onsite. With Electronic finger signing, you can hand your tablet over to your customer to capture their signature using their finger or stylus. How much does QuoteValet Mobile cost? It's FREE - included with your current QuoteValet subscription at no additional charge. Do I have to download or install anything to use QuoteValet Mobile? We designed QuoteValet Mobile to be completely browser based in the cloud. There is no need to download any apps from the iTunes Appstore for iPad users or Amazon / Google Appstores for Android devices. Can I add products to my Mobile Quote? Yes! QuoteValet Mobile enables you to add ad hoc items on the fly as well as add products and services from other templates you have already uploaded to QuoteValet Mobile. Can I make changes to my Mobile Quote? Yes! Once the Quote is submitted on your mobile device, you can open it in QuoteWerks, make modifications, and update it on QuoteValet. Can I add notes to my Mobile Quote? Yes! The Introduction Notes for your client and Internal Notes (not seen by your client) are accessible for you to make notes about the quote. 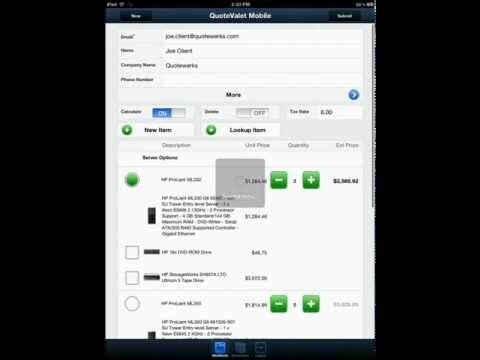 Are there videos that show me how to use QuoteValet Mobile? Yes! We have a dedicated Playlist on our YouTube Channel for QuoteValet Mobile. What Browsers can I use with QuoteValet Mobile? QuoteValet Mobile was designed to run on HTML5, WebKit based browsers. The list of known supported browsers are as follows: Android Browser, Google Chrome, RIM Blackberry Browser, Bada Mobile Browser, Kindle Fire Browser, and Safari. QuoteValet Mobile was developed and tested on an Apple iPad and is the recommended mobile device. To request more information, please email sales@quotewerks.com. The QuoteValet Subscription is available with QuoteWerks Version 4.7 and higher. The QuoteValet Subscription is an additional module and requires a current UMP.